I am interrupting my series on indexing (Part 1, Part 2, Part 3) because a distressed client last week left me thinking about how to help authors with version control. It is hot in Cairo. Daytime temperatures have been 100° F (38° C) for weeks and many of us, myself included, do not have A/C. It makes some of us fuzzy-brained and sometimes our computers overheat. That is what happened to a client (I will call her AB) when she called me repeatedly to help her with a file. As a result of this confluence of problems, I spent two unpaid hours “hand holding” over the phone when I really wanted to work on another client’s book. AB had “lost” the file I edited and returned four months ago. I told her to find my email, redownload the file, and then save it as ED 2. She had problems doing that. I sent her a copy of the file with SECOND EDIT as a prefix to the name, but she had problems downloading it, finding the Downloads folder, and then finding the folder she wanted to put it in — because she had several folders with similar names. I was starting to get impatient and I wanted to tell her that I was going to charge her for my time on the phone, but we had never agreed to such a thing. Did I have the right, then, to ask for it? Would I have actually been able to collect it? I could hear in her voice that she was getting more and more frustrated. She really needed someone to walk her through what should have been simple procedures. I found it difficult to believe that she really did not know how to do basic things like downloading a file and putting it into another folder. From what she was saying on the phone, it seemed that she was opening the file and copying the text of it rather than copying the file itself from its folder. Did she really not know how to do these things, or was the combination of age, heat, and computer problems overwhelming her? I have had clients who did not understand some things, such as using Track Changes, but I can send them instructions or send them two versions of an edited file, one with tracking visible and the other with all changes accepted. This was the first time I had to attempt to walk someone through basics. Should I have done anything differently? What would you have done? I welcome your answers in the comment box. AB’s biggest problem was version control. This was not the first time she had called me while looking through multiple folders or files with similar names. She had been working on translating a book for many years, and in the end, she sent me the manuscript for copyediting in two parts. Now she had multiple versions of each part and several different folders, and she could not figure out where she had put the one I had edited or which file it was. I open the original and use Save As to make a copy with “ED 1” prefixed to the filename. I don’t make any changes in the original (though I might look at it) while I edit version ED 1. 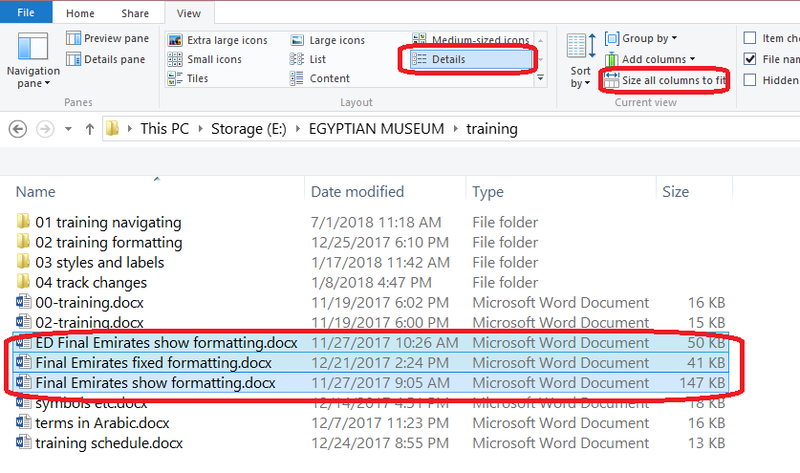 When I return ED 1 to the client for review, I tell the client to use Save As to put “ED 2” as the prefix to the name, to work only in the ED 2 file, and to return it to me for checking. Another recent client (“CD”) keeps adding new material to his book — but he follows my early instructions to save the file with a higher version number. He knows that files to me should have an even-numbered version number, and I return an odd-numbered version to him. CD recently sent me ED 10, but before I could get to it, he wanted to add still more lines. I instructed him to call the newest one ED 10.2 so that we could maintain the pattern of even numbers from him and odd from me. We have not had a problem with version control with this work pattern. AB, on the other hand, has multiple versions that she cannot distinguish from one another. When you have several files with names such as these, how do you know which is the latest? If you tend to retain older drafts of your work, you need to systemize your naming of different versions. Keep the basic filename the same — not with different names as AB did — and add a number and date to each version. (I once joked with a managing editor that she had kept the same spelling mistake in the filename of volume three of a book I was about to index, having indexed volumes one and two with the same misspelled file. She replied that the spelling mistake was the designer’s, but she retained the same filename rather than mess up the designer’s system.) You can, of course, put the version number at the end of the filename, but I find it easier if the number is at the beginning. Once you have more than two or three drafts, ask yourself if you really need to keep the earlier versions. If you cannot bear to delete them just yet, put them into a folder marked “early drafts” or “older stuff” so you do not confuse them with more-recent versions. You can also use an option described below to hide files so you do not accidentally work in the wrong ones. I did not think to tell AB this on the day I was helping her stave off a total meltdown — with her computer problems and distress, she probably could not have absorbed it anyway — but did you know that you can change the view of the files so you can see information about them, including when they were created and/or last modified? If you open a folder and click on the View tab, you will find options for showing the contents of the folder. Many of the people I have worked with like to use medium or large icons, which display across the screen in rows. The icon view is easier if you like to drag files into subfolders because your “target” is bigger. In this example, I have also turned on the Navigation pane on the left side, which allows you to scroll to quickly find other folders. My own preference is usually for List — I have shown it here without the Navigation pane. If version control is a problem for you, try the Details view, and play with the Sort by options until you find the one that is best for you. It seems that Date Modified, Type, and Size are the default details, because these are the ones that have always appeared when I chose Details view without making any changes. I will talk about some of the options below. You can resize the columns by positioning the cursor on the barely visible line between the column names and dragging. You can also choose Size All Columns to Fit to show the most information. If you go to the top of the folder under Current view, you will find many more options. If you click on the triangle under Sort by, you can choose to sort your files by something other than name. 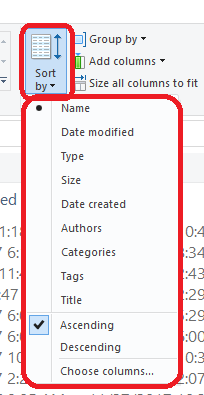 Date created or Date last modified would be good choices for version control. 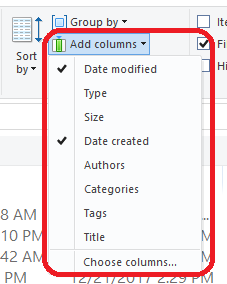 The Add columns menu lets you choose which details to show. Use this along with the Sort by options. Another useful option is Show/Hide. You can select one or more items, then click on Hide selected items. The files will still be in the folder but will be invisible. This is useful for version control so you do not accidentally open and modify the wrong files. If you want to see hidden items, you can check the box next to Hidden items. Their icons will appear faded in the folder. If you no longer want to hide them, select them and click on Hide selected items, which is a toggle switch, to “unhide” them. If you have problems with your filenames as AB does, I hope you will now understand why it is important to maintain version control. Keep the basic filename the same and add date or version number to the filename of each new version. Delete older versions that you no longer need. If you really cannot bear to part with them, or if they contain ideas for later works, put them into another folder with a clear name or hide them from view. Play with the folder view options I have described here (and the ones I have not, such as panes) to find the options that work best for your working style. A very good topic of conversation! My most recent client sends me revised files, called the same thing he called them previously, and I track the versions by adding a date to the filename when I download it. I have also been keeping backup folders, named with the date of the backup. I actually back up the whole project to a new folder each day I work on it. I know this isn’t possible with some projects, but this is working. I’m the one who is keeping track of versions and changes, not the author. But I so appreciate your advice here (to use a number in addition to the date). Thank you! Glad this was helpful. In AB’s case, she had version control problems of her own before she started sending the work to me. It sure can be confusing! I do something different. I use a cloud service with version control, and give my client access to the folder containing his or her files. When one of us uses a file, we lock it so the other person can’t make changes to it, download the file, and work on it. When we’re done, we unlock the file and upload the new version. We NEVER change the file name, or the versions won’t stack properly. We can look back at the last 200 versions, if we want to. We can see who uploaded each version and when, and we can look at any of those older versions. Meanwhile, the current version stays on top of the pile. I’ll never go back to the old way again. Anne, what is the name of that cloud service? One issue in this article that needs to be addressed is that the client doesn’t have a good understanding of how to properly download and store a receive files in email. Not knowing what email program the client uses can make it difficult to give her a good step-by-step procedure for putting the file in the same location every time. It’s possible that the process of downloading a file can vary based on several factors between document versions. In Thunderbird (which I suspect isn’t the client’s email program), when I receive an attached file, there’s a Save button in the status bar of the email message. Just clicking that button will store the file in the most recently used folder. The button does, however, have a drop-down arrow that allows me to select Save As…. 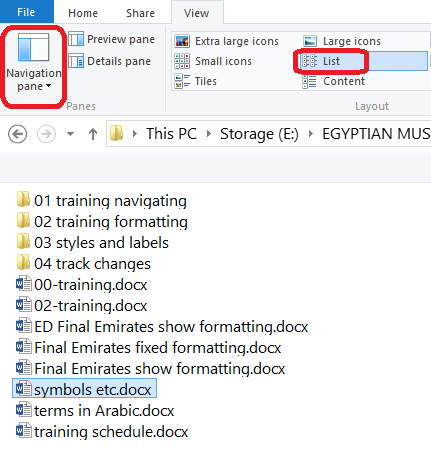 If I choose that option and then save the file, Thunderbird then displays an Explorer-style window that allows me to browse to my preferred folder. On my computer, I have a folder for each individual client. So I’ll navigate to that folder to store the file in the proper location. Because your client isn’t well trained in these issues, it may be necessary to schedule a training session tailored to her specific email program and also to create a logical folder structure that’s easy to remember on her computer. There are tools where you can access the client’s computer yourself in order to help set things up. What I usually do with file naming is append a date in the form yyyy-mm-dd to the end of the file name. That way each new version has a unique file name and if I sort files by file name, they’ll sort in date order automatically. For example I might start with a file named GreatAmericanNovel.docx. When I want to revise the file, I’ll do a Save As… and append the date so the new file name would be GreatAmericanNovel-2018-08-24.docx. Subsequent files will be saved with the current date appended. If by chance I do two revisions on the same date, I’ll append a lower case a after the date. Thanks for that advice on adding zero to the version number. I hadn’t thought of it because CD was the first client I’ve had who ran into so many versions. I usually don’t go beyond 3. Client AB definitely had problems, though I still think that that one particular near meltdown was a confluence of factors. AB has now sent the files to the publisher, and my work is done. For most projects, I just add -R or -R1/-R2, etc., to the filename once I’ve downloaded and saved the original, but some recent ones have required more detailed labeling. That’s when adding a date can be a big help – for both client and editor. I prefer adding to the beginning of the file name so I don’t have to show the whole long name. But any system that works is good. This is so helpful! I need to be more deliberate about version control. Thanks for all the tips! Not sure if this would have worked for you given the heat and your location, but what I have done this last year when my 83-year-old client was getting similarly muddled was use an app like Skype or Zoom to get him to share his screen with me. Then I walk him verbally through the steps he needs to take, and I can see immediately if he starts to go astray. Zoom mighy actually be best for this, because the other party doesn’t need to download anything. If she can click on a link in an email, she can “join” the Zoom “meeting” you’ve set up. I’m going through this right now with a client. I have now spent at least six hours in total over the course of only the first of two rounds of edits, holding her hand through basics. I am trying to be patient but am working on figuring out a way to gently tell her these are things she needs to look up on her own, since they are VERY basic. (For example, I hit “enter” to create a new paragraph in a spot that needed to be split up, and she wrote me an email, saying, “I see “add paragraph” [in the margin notes] and don’t know what more you want me to add here.”) How do I explain to someone that it’s their job to know the basics about the number one tool of their own craft? We’ve had version control issues because she swore she “couldn’t do anything” with the revised file I sent her—I’d made no special effort to lock the file, so it’s definitely user error. I explained how to save as a different file name and she claims now she can’t find them. Sigh. I’m consistent with renaming so there’s no question of what’s been the most recent, but she can’t seem to grasp how to open and use them. In the most recent file, she decided to work on it from Google Docs, which I’m fine with, but she didn’t make a copy as I told her to, and because she was working on the original (shared) file, I received dozens of email notifications daily, each time she made a change. I also struggle with making her understand how much this handholding should cost, as it’s a huge drain on my productive work time, but did not set those conditions prior to starting the job and don’t feel it’s appropriate to spring an extra charge on her. She has plans for three books in this series, though, and you can bet I’m going to politely outline scope creep and hourly consult costs for the next ones.